"I have made this recipe for my family for several years now and it never disappoints. My kids take it on ski trips to share with the team and everyone always loves it! They always want to know why our hummus is a dark brown color. It's the olives! The recipe is equally great without the olives and/or feta. Wonderful with pita bread, chips, crackers, or veggies!" Blend garbanzo beans, 1/4 cup olive oil, lemon juice, feta cheese, tahini, chili sauce, olives, garlic, basil, cumin, dill, and salt in the blender until smooth. Add water for a thinner consistency. 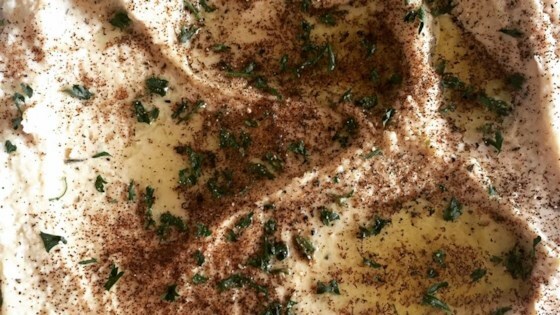 Transfer hummus to a serving bowl and garnish with parsley and drizzle with 1 teaspoon olive oil. Serve warm or cold. Celery salt can be used in place of regular salt. Add more olive oil instead of water at the end of blending if desired. Not much flavor to this. Followed recipe except for adding a dash of cayenne. Will stick with Roasted Red Pepper Hummus. Absolutely worth all the ingredients. Slight sweet and salty twist on the traditional hummus flavor. I used all ingredients as listed. Was fantastic! Will definitely make again! Thanks ks for the recipe! I halved the recipe, and it turned out delicious and fluffy. This will be the recipe I use for hummus from now on. So delicious and creamy! Must say though, it was more on the sweeter side than anything else but I added cayenne pepper for a little kick. Will be my new go-to! Thank you!